If you’re undergoing orthodontic treatment, then chances are that you care about maintaining the health of your smile. Straightening your teeth, however, is only one aspect of helping your mouth look and function its best. Brushing and flossing your teeth is essential to preventing dental issues like tooth decay, which begins with plaque accumulation. When your teeth are crooked or adorned with braces, plaque can find additional spaces to hide, and reaching it can become more difficult. Luckily, there are steps you can take to increase your protection when other factors increase your risk for cavities. Lake Worth orthodontist, Dr. Cabal, explains why hygiene is especially important when you’re wearing braces. Among the 600 different kinds of oral bacteria that contribute to dental plaque formation, one in particular has been singled out as a significant factor of tooth decay. Streptococcus mutans converts the sugars and carbs in your meals into lactic acid, which erodes your tooth enamel. Over time, bacteria can slip past weakened enamel and infect your tooth’s inner structures, leading to tooth decay. As your body’s strongest substance, enamel is your teeth’s first line of defense, and while it can’t rebuild or repair itself if damaged, it can absorb certain minerals to gain strength when weakened. Unfortunately, acid erosion also saps your teeth of the minerals that enamel requires, depriving your teeth the ability to maintain their integrity in the face of continuous acid attacks. Although crooked teeth and orthodontic treatment can increase the need for diligence, preventing cavities and other dental issues is not a daunting task. Be sure to brush your teeth after every meal to clear away bacterial plaque and the food debris that feeds it. 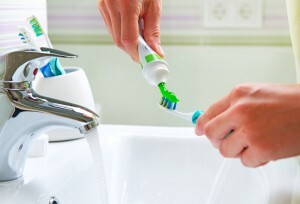 If brushing isn’t possible, rinse your mouth with water or mouthwash. For increased protection, ask your dentist about fluoride treatments to increase the strength of your tooth enamel. To learn more about keeping your smile and your braces clean, call Lake Country Orthodontics today at (817) 236-7846 to schedule a consultation with your orthodontist. Located in the 76135 area, we proudly serve families from Lake Worth, Azle, Saginaw, Springtown, Weatherford, Haslet, Lake Worth, and all surrounding communities.